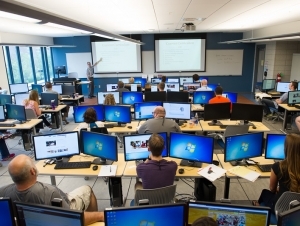 In an effort to attract more teens to the computer science field, Buffalo State’s Computer Information Systems (CIS) Department is offering a free workshop for Western New York high school teachers June 28–30. The fourth annual CS4HS (Computer Science for High School) will be held in the campus’s Technology Building and approximately 40 teachers representing 28 public- and private-high schools are expected to attend. CIS faculty members Sarbani Banerjee, Neal Mazur, Ramona Santa Maria, and Charles Arbutina will present workshops on computer programming, web design, and problem-solving exercises. They also will provide an overview of the curriculum associated with the new AP Computer Science Principles course. Sponsored by a $25,000 grant from the search-engine giant Google, CS4HS is intended to convey various concepts of computer science as well as strategies for attracting students to the field. Participants will receive books, educational materials, and a certificate for 20 hours of professional development. The workshop is a boon for students because computer science remains one of the more lucrative fields with a multitude of job prospects. According to a recent article in Business Insider magazine, by the year 2022 approximately 140,000 job openings are projected for software application developers and 127,700 for computer system analysts. Nationwide, the median annual salary for those professions are $90,000 and $72,000, respectively. CS4HS organizers plan to hold a follow-up workshop with the same teachers in the fall and a reunion in the spring to discuss successes and challenges. To interview one of the faculty organizers, contact the CIS Department at (716) 878-5528.